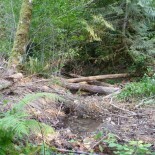 Marys River Watershed Council joined the Willamette Model Watershed Program in 2010. The program was designed to increase the scope, effectiveness and ecological outcomes of our work for water quality, fish and wildlife habitat. Entry into the program was a on competitive process, based on a proposed 10-year Action Plan. MRWC chose to enroll four sub-basins in the Model Watershed Program — Beaver Creek, Greasy Creek, Woods Creek and TumTum River (Shotpouch Creek). 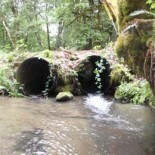 We joined a cohort of six other watershed councils, representing the Luckiamute, Long Tom, Middle Fork Willamette, Calapooia and North and South Santiam rivers. Attracted by our clear, landowner-supported, and ecologically-sound targets, the program brought us a short-term increase in restoration dollars. The recession prompted belt-tightening as OWEB’s lottery-based restoration funding stream diminished. While budgets have recovered, funders are increasingly prioritizing watersheds with ESA-listed fish species (Chinook, steelhead). Five years into the program, we have exceeded our 10-year targets for fish passage barriers and invasive Japanese knotweed along our streams. We only have 1.5 miles to go to meet our riparian planting and in-stream habitat targets. Just as a stretch exercise, we revised these targets upwards in 2015. If restoration funding is available for cutthroat trout habitat, we should reach our new goals by 2020! 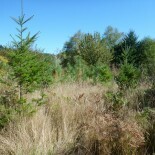 In addition to the boost in restoration dollars, the Willamette Model Watershed Program created a cohort of watershed councils that have benefited greatly from information, skills sharing, and joint investment in shared infrastructure (e.g., ecological monitoring, project database, common plant orders). Belknap’s lower crossing on Duffy Creek, prior to culvert replacement. 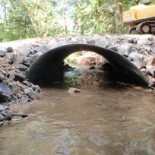 Belknap’s lower crossing with new, open-bottom arch culvert. 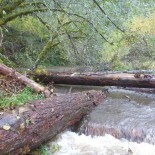 Large wood structure placed on Rock Creek, 2014. Future large wood for Greasy Creek! 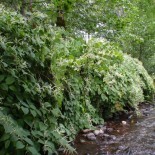 Japanese knotweed on Greasy Creek, prior to treatment.